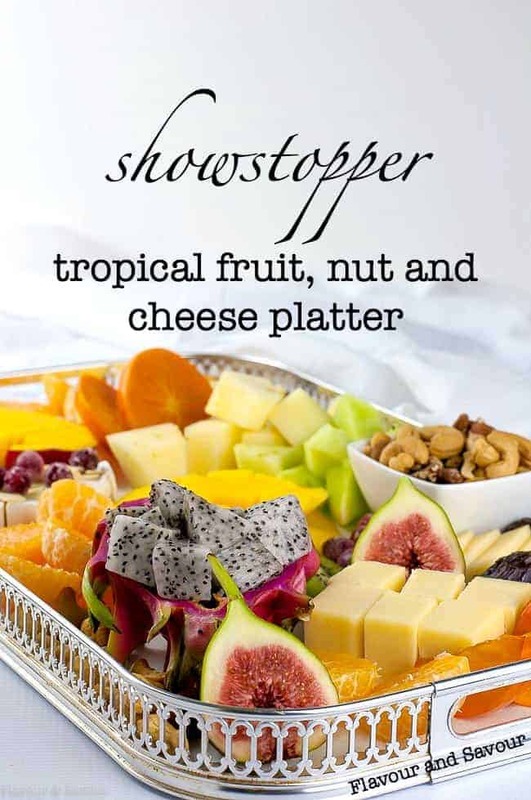 A showstopping appetizer platter filled with exotic fruit, assorted cheeses and mixed nuts. 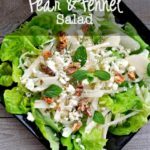 Switch it up and try something different! 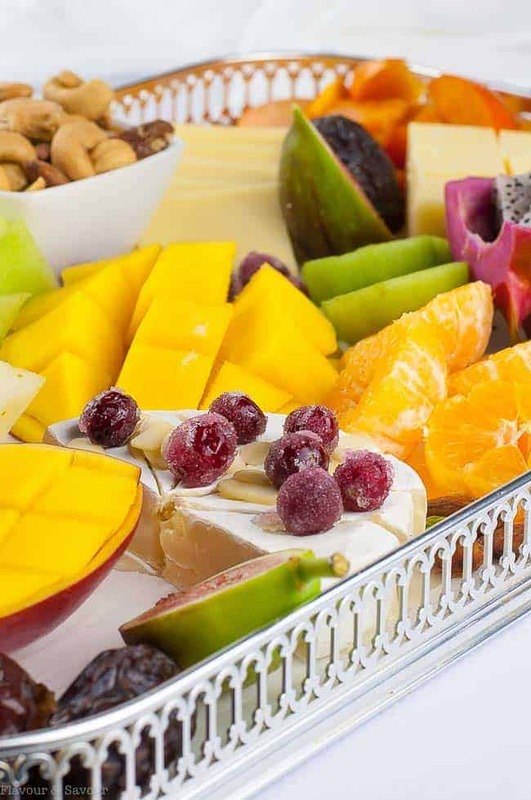 If you’re planning on serving a traditional platter of veggies and dip, or a cheese tray at your next get-together, why not switch it up and put together a fruit, nut and cheese platter instead? It’s may be a welcome change, or even a conversation piece. 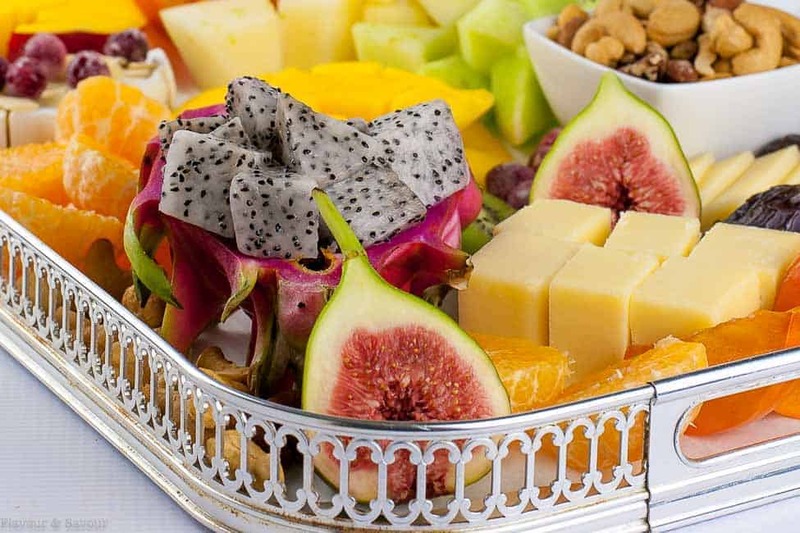 Choose the best quality fruit you can find, as it will also have the most flavour. You might want to buy it a few days before you plan to serve it, as some fruits (like mango, for example) sometimes need time to ripen. 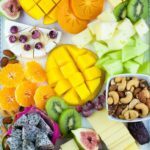 I chose dragon fruit, persimmon, mango, fresh figs, honeydew melon, Santa melon, clementines, sugared cranberries and Medjool dates. Avoid fruit that will discolour when exposed to the air, like apples and pears. I added four different types of cheese: Brie, Raclette, Gruyère, and Cheddar and set out a bowl of my favourite mixed nuts (from Costco.) 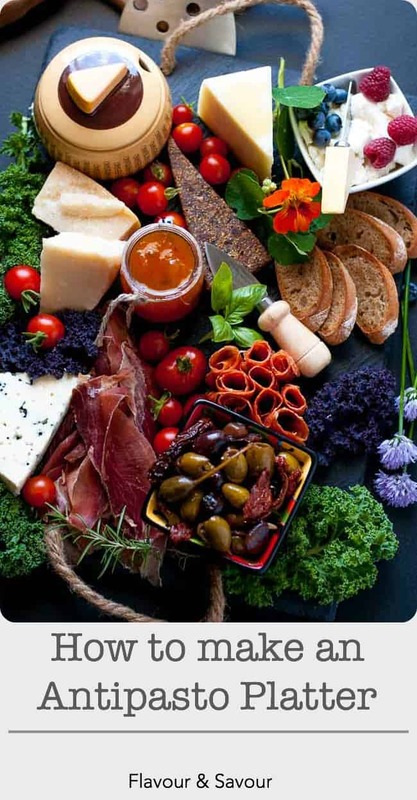 Cutting or cubing the cheese makes it easy for your friends to help themselves. For example, slicing a persimmon shows off the star shape inside. Peeling and cutting clementines in half makes them look almost like flowers and is much more attractive than sectioning them. Black and white speckled Dragon fruit is spectacular, but the bright pink skin is even more beautiful, so it’s fun to make a bowl out of the fruit and serve the flesh in it. 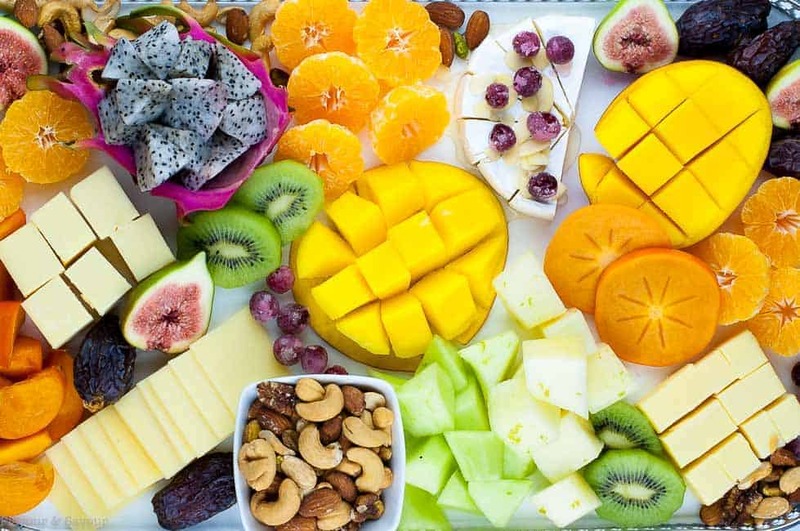 Cut the fruit in half lengthwise, scoop out the flesh by loosening the edges with a paring knife, then bend back the skin with your fingers, and the flesh will come out easily. Slice and cube and pop it back in the shell. To cut a mango, examine it to find the slight bump in the skin that indicates which way the seed is aligned. Slice down on each side to remove the seed. Slice the flesh lengthwise and crosswise, run a knife around the edge and bend the fruit “inside out” so the cubes pop up. Make some sugared cranberries to garnish a wheel of Brie! Heat maple syrup, add fresh cranberries, soak, drain, then toss with sugar. Find the recipe and full instructions for Sparkly Sugared Cranberries. 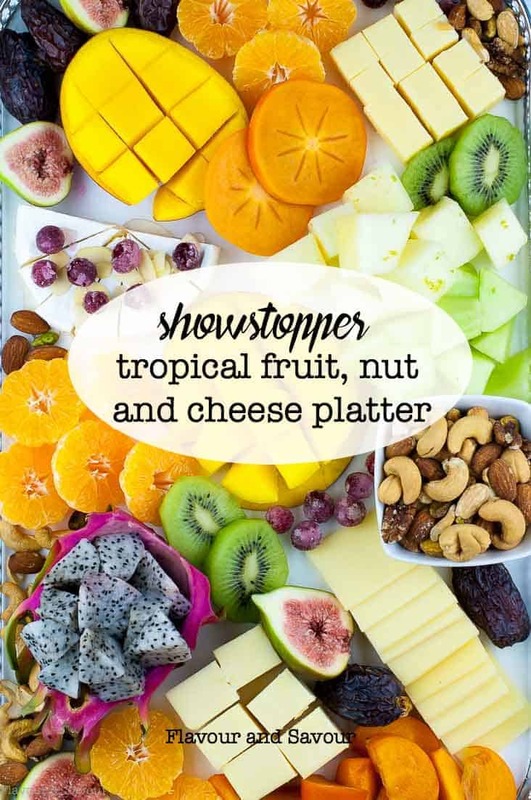 This Tropical Fruit, Nut and Cheese Platter of exotic fruits, assorted cheeses and mixed nuts makes a showstopper appetizer and it's naturally gluten free. Cut the fruit into cubes, slices or quarters, depending on its shape. Do the same with the cheese. Place the nuts in a small bowl. 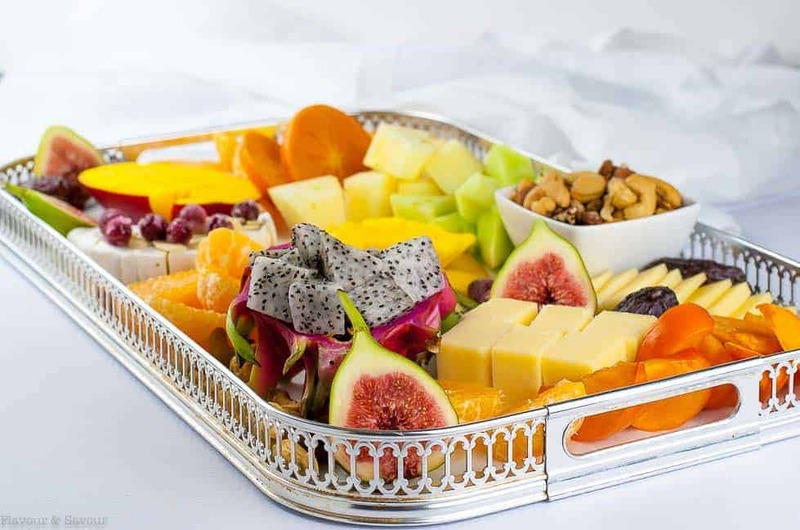 Arrange attractively on a tray or platter. Refrigerate until serving time. I used dragon fruit (pitaya), mango, kiwi, persimmon, clementines, honeydew melon, Santa melon, figs, Medjool dates and sugared cranberries. 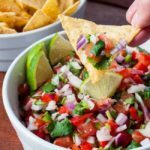 *It is difficult to calculate a calorie count for this recipe, as it will depend on the type (and amount) of each fruit chosen. This is such a colorful and stunning work of art, Elaine! 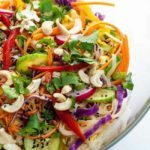 I’m a sucker for food boards of all types, but I’ve never seen one so vivid and bright before. 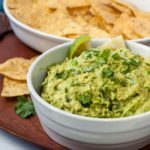 A perfect pick-me-up for winter entertaining!